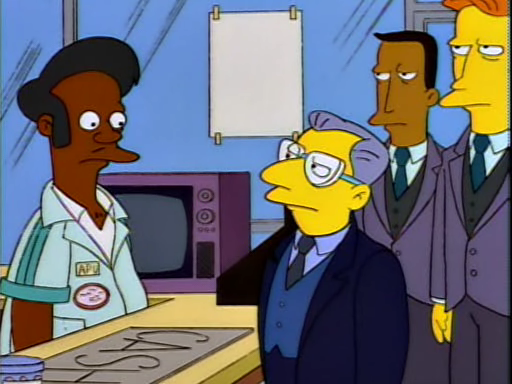 Much as I love this episode, it’s always bugged me that Apu wears a Kwik-E-Mart uniform we’ve never seen him in before – just to facilitate the scene in which he has to go through the shame of his badge being removed. Doesn’t bother me, it’s too great as a parody of the action movie scene where the officer turns in his gun and badge. The ankle holster for the pricing gun is just too damn funny. Obviously he put on the uniform because the boss was coming in. Nope, he was wearing that uniform from the very beginning of the episode, long before there was any reason for the boss to come in.